Using a cookie press is not difficult, it just takes a little practice to get into a rhythm, so that your cookies are comparable in size and look. But really, homemade cookies should have some differences - that's what makes them delightful. Handy for more than making cookies, you can use a cookie press to ice cupcakes or cakes, or fill deviled eggs or cream puffs. A cookie press makes the daintiest, cutest shaped cookies or neatest iced decorations and results are so professional, you'll feel great serving them. Most cookie presses on the market are manual presses that use either a handle turning process or plunger system to press out the dough. Sizes of presses vary as do accessories and you'll want a variety of discs for cookies, and tips for decorating with icing. Cuisinart makes an electric version and it comes with a good assortment of discs and tips, including Holiday motifs. You can read my review for more information: Cuisinart Electric Cookie Press. When it comes to using a cookie press, there are do's and don'ts and it takes a little practice, whether you use an electric or manual press. Allow sufficient time! Once you get the hang of using a press, it's a quick process, but if you're starting out, allow lots of time for set-up, reading your cookie press manual, gathering appropriate recipes and the clean-up. Use only cookie press recipes: This is crucial to the press working right; dough needs to be soft and a certain consistency. There are lots of recipes available and avoid adding things like nuts, raisins - they do not press. 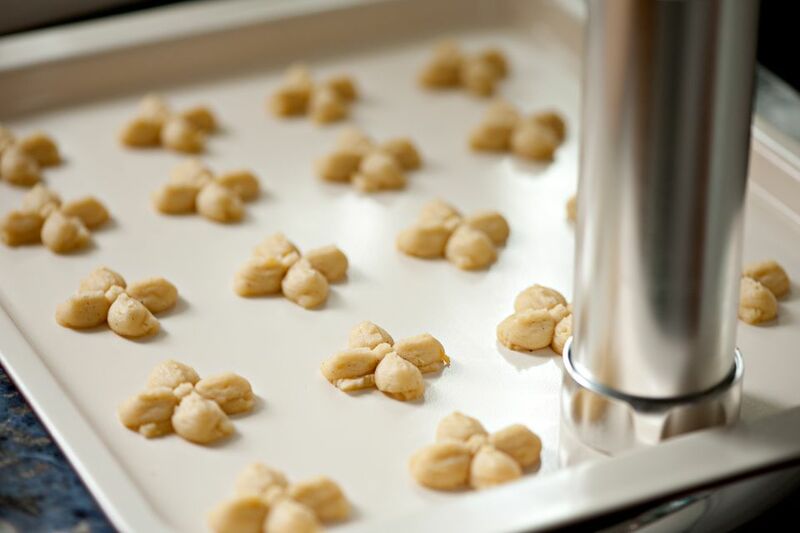 Baking sheet should be ungreased: Pressed dough must adhere to a cookie to form properly; avoid using parchment paper - a bare baking sheet is best. Remove air from the press: Press a little to remove air and bring dough or icing closer to the disc or tip. When filling the shaft, press it down as you add dough/icing. Hold press flat on the baking sheet: Avoid tilting it or 'dropping' batter. To press and adhere to the baking sheet, it needs consistent, even pressure. Don't overload cookie: It may look like a little batter with spaces between motif cut-outs - that can still bake into a full, delicate-looking cookie. Pressed cookies should denote their shape after baking; overloading them fills in too much and they will just look like a round cookie. Practice, practice: Your first cookies may not look as nice; they may even have a dragged look. Just scrape that batter off the baking sheet and return to the dough bowl. Try again, you'll get it and it's so much fun when you get into a rhythm. It may help to count 1, 2, 3...as you go. Wait before lifting: Before lifting the press and moving to the next cookie, give it a second after stopping the press action, to allow the released dough to grab the cookie; you'll have less 'strings' to return to the bowl. Allow space between cookies: They do rise but don't need as much as some other cookies - just 1-1/2" or so. Cool cookies before removing: They are fragile; you'll need a very thin cookie spatula - metal is best. Though the sheet is not greased, they will appear to stick but will come off. Allow clean-up time: Cookie presses have lots of parts, though some may be dishwasher safe, you can avoid losing small parts by hand washing and dry completely before storing. A manual press is cheaper to buy and there's more variety on the market. It also has no cord to worry about. Though you can press cookies and decorate desserts with either type depending on accessories, an electric cookie press gives you a consistent and continuous pressing which is ideal, especially when decorating with icing. It can also save you time over a manual model. Note that an electric cookie press does not mean you can press heavier doughs and batters. You can actually press heavier doughs with a sturdy manual model because you can add the pressure you need. If you want to only make cookies, you'll need discs - the more the better. But if you want to also decorate with icing, look for a model that has a good assortment of both discs and pastry tips. Check the quality of the model and that the shaft attaches easily and securely to the handle. A larger capacity (shaft) means less refilling, but it also means a larger tube to hold. Chose one that is comfortable to handle. Avoid models that could rust; it's very difficult to get all the dampness out of some grooves after washing. If you have problem hands, a turning style manual press or an electric model may be best, rather than a hand plunger type. If buying for a child, choose a smaller shaft with a pressing system he/she can manage.